Discussion in 'Sound, Music, and Intercom' started by dc713, May 2, 2009. Picked up an almost mint condition CS-210 system that mostly works. This stuff looks like it was never used. Probably the problem was straight out of the box but they never sent it in for warrenty repair. Symtoms: Control headset cannot hear remotes. Daisy chained beltpacks and headsets can hear each other. At one point the control headset mic remained open even when the switch was set to off. I did switch the headsets and the problem is with the control box. Smelled something and after opening the control box the R115 resistor located close to the middle of the board was burned. Can someone familiar with the CS-210 tell me the rating of the R115 resistor? Looking at the manufacturer's web site is always a good place to start for such information, a Parts list and schematic are on the last two pages of the manual that is available in the Support section on Clear-Com's web site, http://www.clearcom.com/support/manual_pdfs/manuals_party_line/manual_pl_cs210.pdf. However, my concern would be what caused it to happen and by replacing the resistor are you addressing the cause or just the symptoms. I did start with the manual. Unfortunately, the scan is so bad in the pdf I can't read the information. I also understand that just replacing the resistor may not solve the problem, but it is a place to start. Also, the first cable I tried with the unit registered a short, which may or may not be related to the burnt resister. If you have not already done so, try contacting Clear-Com, they may be able to help you or at least get you a clearer schematic. The mic on/off/momentary on switch does only affect the one headset directly below it, the other Headset 2 mic is always active. 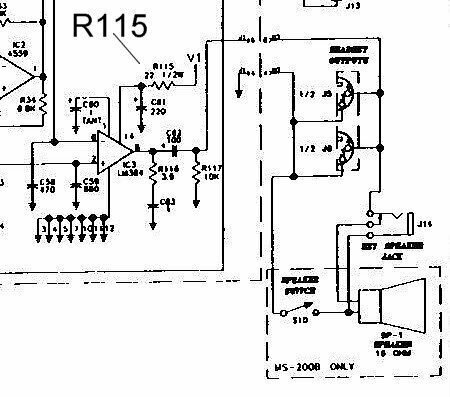 According to the schematic the Headset 1 mic audio (Pin 2 on the headset connector) is wired direct to the physical switch so if the Headset 1 mic stays on with the switch in the off position then that would seem to indicate a problem with the switch. One the headset listen side, I'm sure you've probably already tried this, but if not, make sure the related Monitor Select switch is engaged and try adjusting the Intercom Volume control. It is not uncommon to include fusible resistors in comms masters. Perhaps the failed device is one of those. Also quite possible that you have an age related failure - a cap died while in storage or something not dissimilar. Have you tried feeding in audio to the program input to see if that can be heard in either headset? Most liklely cause of the fault is using a headset with too low an impedance. Possible other option was multiple headsets of not much impedance which would accelerate things. Given we are talking about an older unit, check caps C81, C82 and C83 also because if 81 or 83 have shorted you'll again incinerate R115. If 82 has gone open then you'll have no output.